I like when I get to look at products that compete with products I've looked at before. In this case, about this time last year I took a look at the AirStash. The AirStash is a little device slightly wider than a USB stick with its own wireless AP built-in. I liked the AirStash, but in the end I had to wonder what's the point. When you wanted to use it, you had to disconnect from your wireless network to connect to the AirStash's. But then you had no internet access. For simple file and media sharing it worked well. But beyond that, I was always switching back and forth between networks. So when the Seagate Wireless Plus showed up on my doorstep promising to do the same things and more, I was excited. 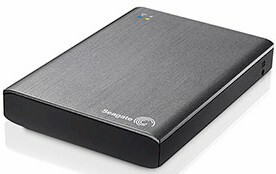 The Seagate Wireless Plus is the next-generation replacement for Seagate's GoFlex Satellite. It sports 1TB of storage, 802.11 b/g/n wireless connectivity, a three-year warranty and a big list of features. The Wireless Plus is easier to take apart than the GoFlex Satellite. But the folks over at Hack Seagate Satellite did it already, so I didn't have to. Here is their photo of the inside. For comparison, here is the FCC filing photo of the GoFlex Satellite's board closeup. The designs appear to be very similar, but use different boards. Both are based on the same T.I. AM3703CUS100 Sitara ARM processor and AzureWave AW-NH630 N150 802.11b/g/n wireless module. The table below summarizes the key components of the two products. Note that the Plus' battery is essentially the same size as the GoFlex Satellite's. So I'm not sure where the extra 5 hours of battery life is coming from on the Plus (the Plus is rated at "up to 10-hours", while the GoFlex Satellite's data sheet states "up to 5 hours"). The Wireless Plus comes in a very unassuming box with a small Quick Start Guide, a 2A wall-wart charger with a USB power cable, and another USB 3.0 data cable that connects to a removeable USM SATA-to-USB adapter at the drive. No manual is included and it took me quite awhile to find it on Seagate's site. Page 42 of the User Guide also references additional support content, but I received a Page Not Found when I went there. Setup was pretty easy. First, I loaded the iOS Seagate Media app onto my iPad. Once the app was installed, I then connected to the Wireless Plus' wireless network, called Seagate Wireless AFL. No wireless security was enabled out of the box. But once setup was completed, a wireless password could be added, which then protected the network with WPA2-PSK encryption. The wireless channel appears to be set to channel 6 and cannot be changed. Once connected to the Plus' wireless network, I just followed the prompts within the Seagate Media app. The first couple of prompts were to test if I could play a video. Just starting up, there were only the Seagate sample videos on the drive. These are 960x540 SD videos in an MP4 format, so they were a good test. Video playback is dependent upon the encoders of the device and almost every device can play an MP4 file.